Six months ago I was sat in the main stand of the Hang Day stadium watching a rather subdued win for T&T over Hoang Anh Gia Lai wondering if I’d ever learn the names of the players let alone figuring out the world of Vietnamese football. Fast forward to a scorching hot Sunday afternoon in the capital and T&T were welcoming Hai Phong for the season’s finale; with the championship sealed last week away at Long An. I have been lucky enough to have followed the team on all of their travels throughout Vietnam, visiting 12 (including Ha Noi where I live) provinces, covering more than 16,000km (approx 10,000 miles) along the way. A few flights were taken, numerous public buses, bicycles, a couple of trains and far too many xe-oms were used to transport me. Well over 100 Café nau da’s along with at least 100 bowls of various noodle soups were used to fuel the trips. There promised to be something of a party atmosphere. With the club keen to lose its status as the country’s poorest supported side, the owners decided to throw the doors open and declare free entry for all fans. I wasn’t too optimistic seeing as visual advertisement was still limited to the street the stadium is on and the game was ridiculously schedule for a 4pm kick, with temperatures rising to 35C in the capital I assumed many would stay away. 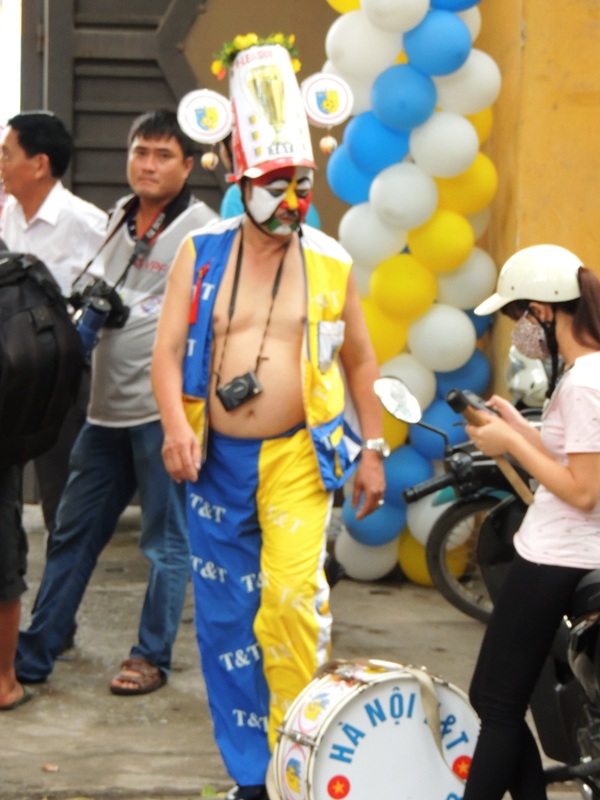 I was keen to soak up the finals days’ atmosphere, especially with a larger crowd expected and also the arrival of ‘fierce rivals’ Hai Phong. I was a little too keen though. The streets were nearly deserted 90minutes before kick off, although inside music was playing and 100 or so fans sat watching the pre-match entertainment. 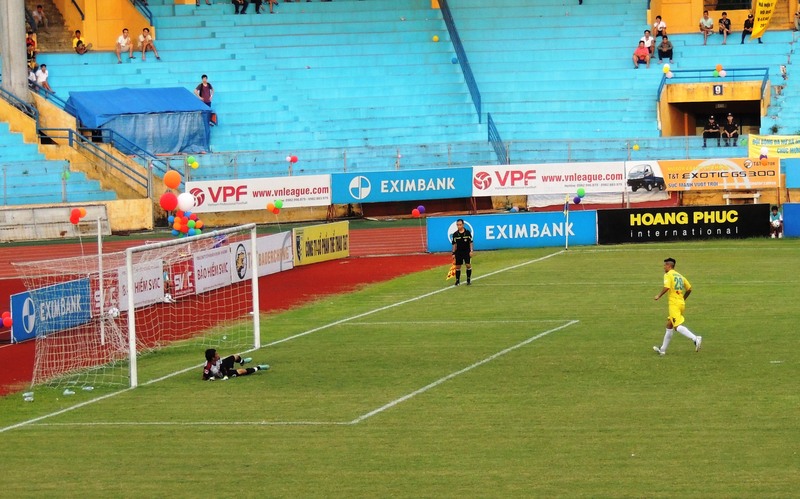 Wandering around I was bewildered as to where the away fans were, Thanh Hoa and SLNA had both previously turned up very early. Loitering in the shade with an ice tea seller I was wishing I’d have appreciated my aircon for another hour when suddenly there was the sound of drums getting nearer. Stepping out in to the road I saw T&T had organized a motorbike parade to the stadium! This was brilliant, approx 100 bikes with their drivers sporting the yellow of T&T and many waving flags had filled the road. The sea of T&T Yellow that I’d been searching for since March had finally arrived!! 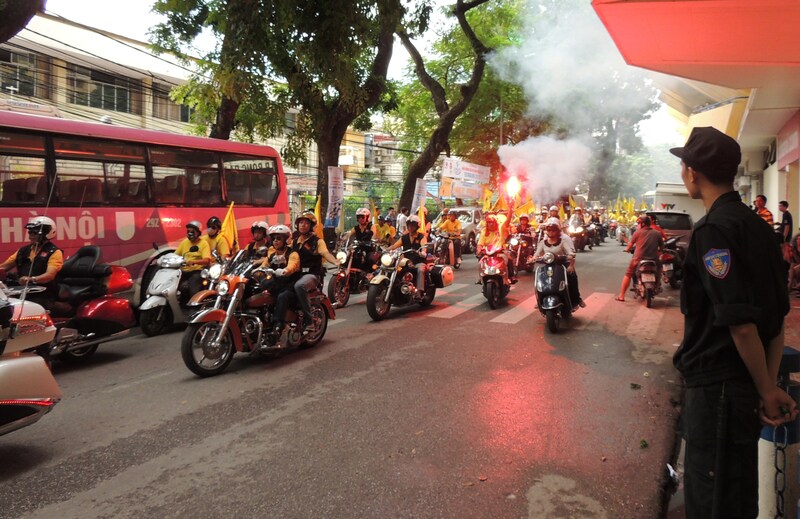 They had led the team bus all the way from My Dinh district to the centre of Ha Noi. The pre-match entertainment was reminiscent to the numerous Primary School opening/closing ceremonies which I’ve unfortunately sat through; a brass band, horrendously long speeches, oversize bouquets of flowers, kids in bright pink & orange outfits performing uncomfortably choreographed moves to odd European techno and two actors screaming a scene in to a microphone (I do hope they weren’t comedians as no one even smiled let alone laughed). The owner released a few cages of weary pigeons, for luck I guess; hilariously some of those pigeons didn’t fancy flying and were poked, kicked and thrown in to the air for encouragement. Some only made it to the shade of the executive area before landing while others took on a more kamikaze approach as they fiercely targeted the crowd! There were certainly more fans than normal in the main shaded stand as regulars who arrived late sat on the steps or joined me standing at the back. The players were enjoying the day, throwing plenty of gifts in to the crowd, signing autographs and posing for photos. Cristiano would again be on the bench due to injury, with Gonzalo returning to the attack in replace of the suspended Samson. An added twist to the game would mean if Gonzalo were to score twice he would join Samson as the leagues leading scorer. He’d not scored since the away game against Dong Nai, due to his recent defensive role. With the title already sealed the need for a positive result wasn’t necessary, but a win would silence any potential critics who may suggest the title success was helped by the withdrawal of XT Sai Gon. As the players lined up and the brass band played a rather nice version of the national anthem I glanced to the far corner where I’d expected the Hai Phong fans to be squeezed in to and it seemed they’d stay at home. I was slightly disappointed as I’d heard they have a very passionate following. Following the tradition of the whole season the game got underway without anyone noticing, even the military brass band continued playing until the fourth official told them to stop. Ha Noi T&T started like the champions they are; playing a high line and attacking at every opportunity. 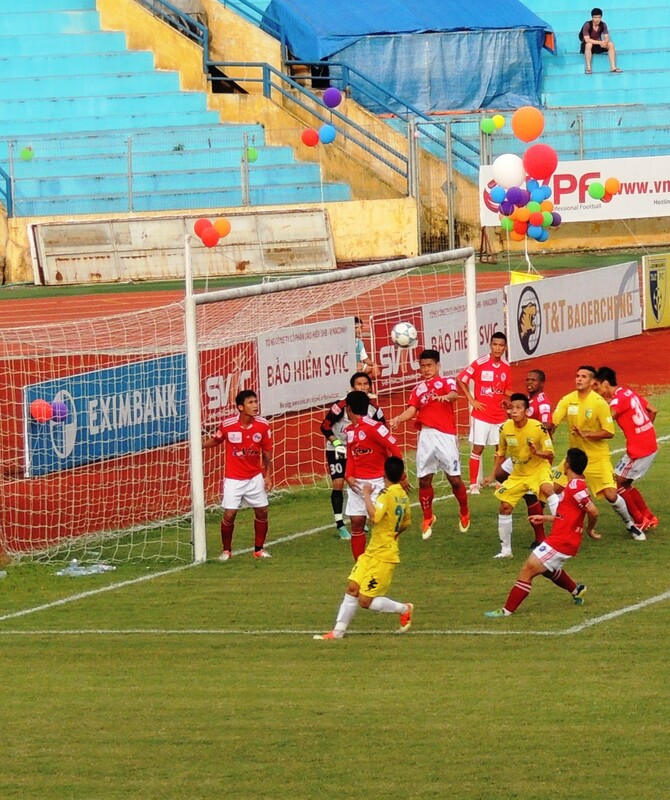 Hai Phong looked deceptively average, rendering to the occasion as T&T took a 2-0 lead. Firstly Gonzalo (17’) scrambled home before Ngoc Duy (21’), for the second game running, flicked home an excellent near post header. I was hoping for one last goal flurry from T&T but Hai Phong, even with nothing to play for weren’t about to lie down and grabbed a goal back just before half time through Le Van Tan (23’). 2-1. 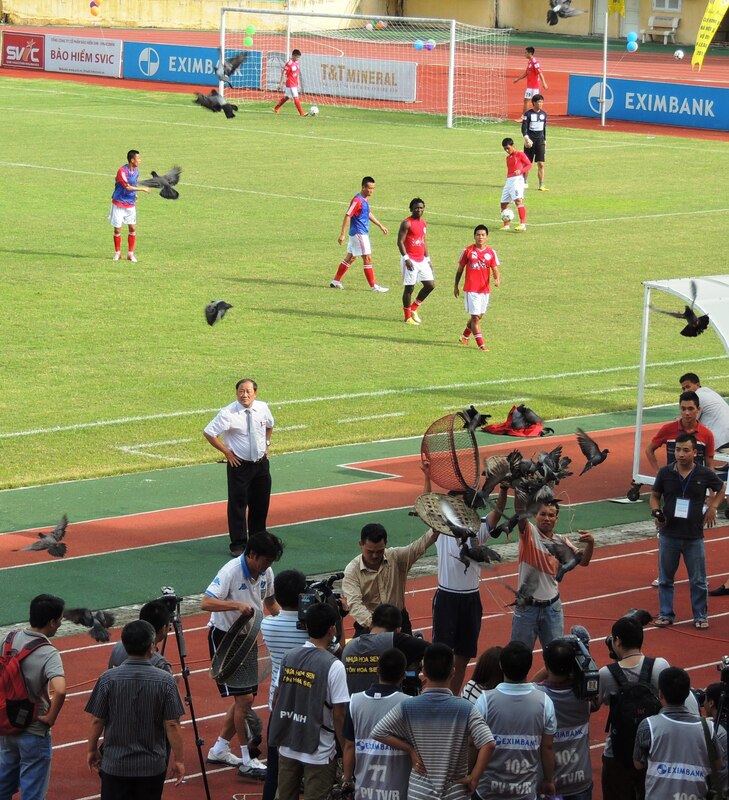 Suddenly a few Hai Phong fans rushed in to the stadium, cheered on by the 100 or so already in the ground. More followed. Then more waving flags until finally well over a 1000 fans had rushed in, turning the corner of the Hang Day in to a bank of red, unveiling a couple of huge flags. Hai Phong had arrived. The half time entertainment was provided by Minh Quan (a Vietnamese popstar) who really livened up the crowd, whilst being accompanied by Cristiano who distributed numerous shirts to the fans. I began wondering if the match actually really mattered, 2-1 up with neither team playing that well. But it does, of course it does, no one likes to lose. From the manager to the players and the fans; defeat would dampen the celebrations. Hai Phong came out strong and deservedly equalized through Dinh Tung (53’), sending the travelling fans wild in the far corner. 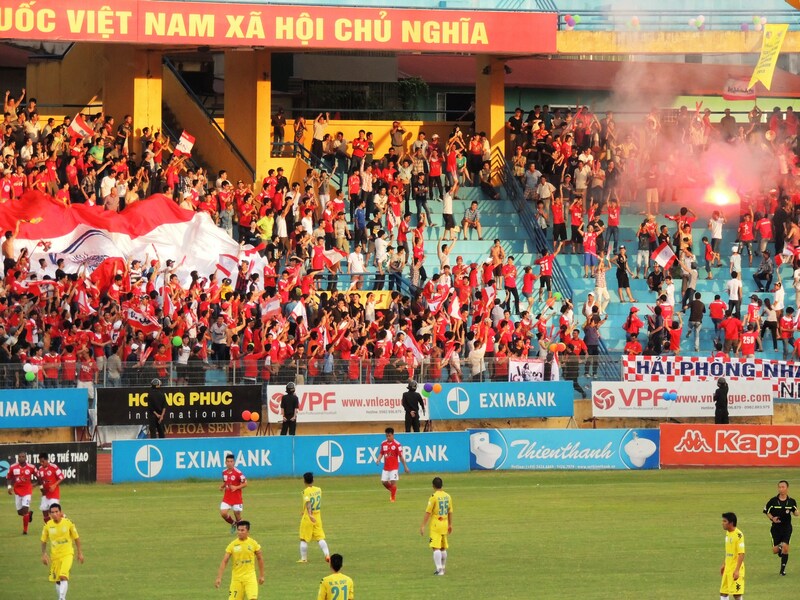 It seemed all Ha Noi needed was to step up a gear to prove their superiority, which they did as Gonzalo (73’) fired home a penalty to put T&T back in front and equal Samson on 14 goals for the season. 3-2. It was far too easy. However Hai phong were instantly able to change gear too, with Ding Tung (78’) again sending the Hai phong fans wild as he score his secong of the game. Both sides seemed to settle on 3-3, a fair result as both teams fought an interesting match in the heat of the capital. I say interesting as I couldn’t figure out if it was a great, average or bad performance from either side. Both teams had their moments. It didn’t matter though and to the delight of the home support, club captain Cristiano was introduced for the final few moments. Possibly a farewell appearance, but we’ll have to wait and see. In a season of strikers playing in defence, Cristiano reversed the trend and partner his friend Gonzalo in attack. With these two imposing South Americans up front it seemed the Hai Phong defence were glad the game was already in stoppage time. Full time 3-3. 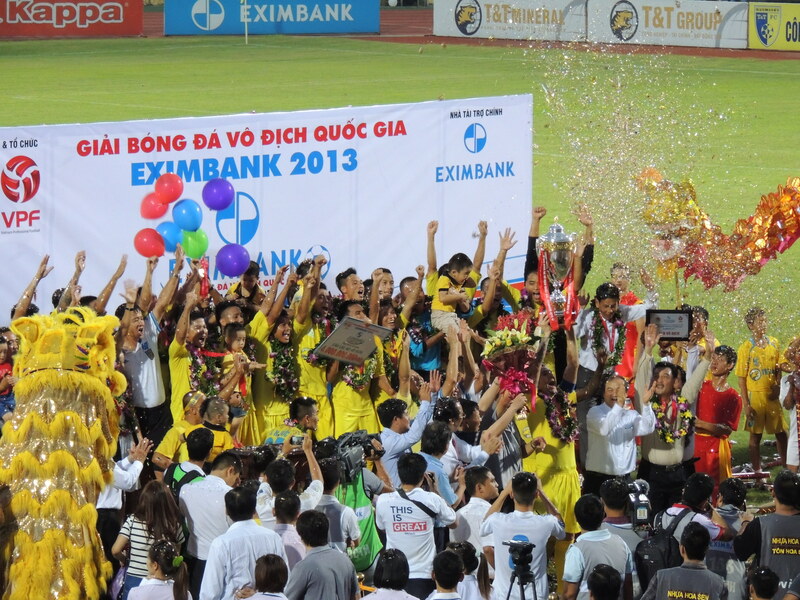 ← Highlights: Season finale, Ha Noi T&T 3 v 3 Hai Phong, 31/08/13. Well done on getting to so many games and for writing such an entertaining blog. How much does that one home game that you missed annoy you now? Will you be going for 100% next season. haha, yes missing one game does bother me slightly, I did take in an extra game (Binh Duong v SLNA), does that count for a complete season?? I’m not sure on next season, there will be three teams from the Mekong Delta, so expensive travel from Hanoi, but I’ll be hoping to get to quite a few away matches.